John H. Thompson 111, 66, of Easton, died Saturday, August 28, 2004, in Palmer Township. Personal: He was employed as a purchasing manager at Dresser- Rand in Phillipsburg for over 40 years. He was also a Notary Public. John served in the Army. 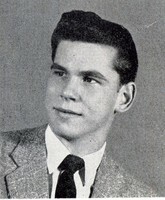 He was a graduate of Easton High School, class of 1956, and Lafayette College, class of 1961. Survivors: his wife, the former Patricia G. Hughes; a son, Michael J. of Easton; and a daughter, Susan Lynn Thompson of Forks Township. Services: Will be announced by the Finegan Funeral Home, Easton.